‘Haunted’ Bridge? 600 Dogs Mysteriously Jumped Over Bridge; Only 50 Survived - 2NGAW! Even experts on dogs are puzzled as to why canines leap over a bridge located next to a Gothic castle named Overtoun House in West Dunbartonshire, Scotland. The century old bridge does not really have unusual or weird features yet dogs almost immediately jump over to the river below upon reaching the bridge, for no apparent reason. The bridge has a death toll of close to 600, with only around 50 survivors. This is quite alarming considering how dogs are often cautious. 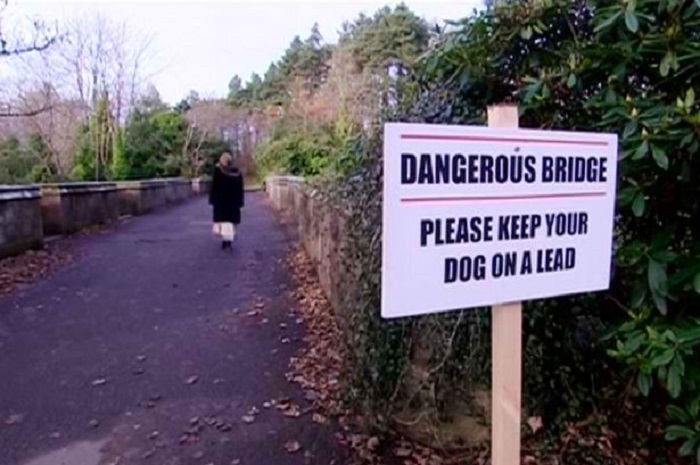 The mystery has remained unsolved but to prevent future dog ‘suicides’, the local authorities posted a sign around 50 feet from the bridge, warning pet owners to keep their dogs on a lead. Leading animal behaviorist of Animal Planet, Dr. David Sands, personally went to the bridge to investigate the case and to find answers. According to him, although he had seen pictures of the bridge in the past, he felt a strange feeling upon visiting it for the first time. Still, he could see anything that could have urged the dogs to jump. He believes it is possible that the dogs are simply curious that is why they jumped. He thinks it is a case “curiosity killed the dog”. The locals have a different version of the story, however. They believe that the dogs are driven to jump into the water by the ghost of the lady of the castle. The explanation just might be plausible considering that the dogs only jump at the same side of the bridge, not the other.